Condiments. I have a love-hate relationship with them. On one hand, they’re delicious and super important to cooking and eating. But they’re also super annoying sometimes. They stack up in your refrigerator door, or get shoved to the back of the fridge to expire and die a slow, anonymous death while taking up a ridiculous amount of room for two years until you rediscover them in your next fridge clean out. But you have to have them, right? My solution – make my own. Especially condiments that rarely get used and are easy enough to make in my sleep. One such condiment is coleslaw dressing. 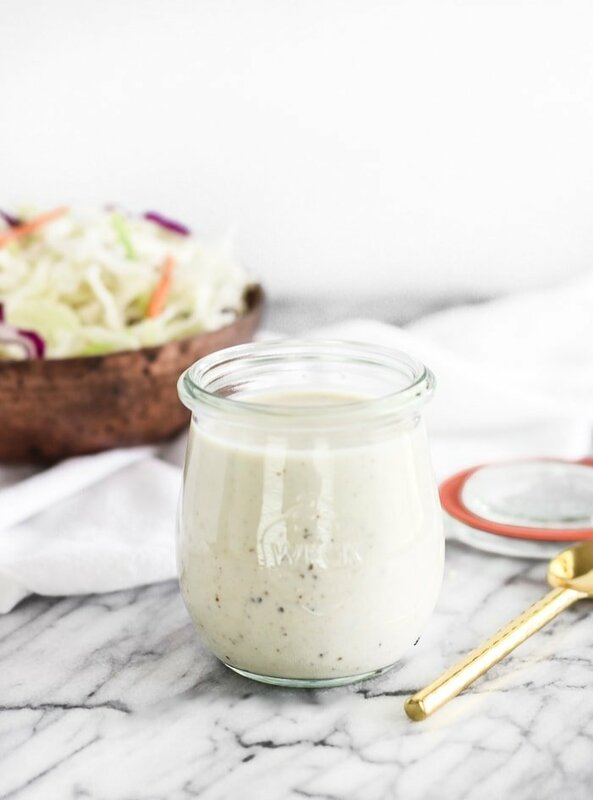 Not only is coleslaw dressing a cinch to make, but it’s made with ingredients I already keep stocked in my kitchen, so there’s no need to buy something new. So any time I need to make coleslaw, which let’s be real, isn’t that often, I can just whisk together a few simple ingredients, and I have just enough for one recipe! Not a whole bottle that will go to waste. 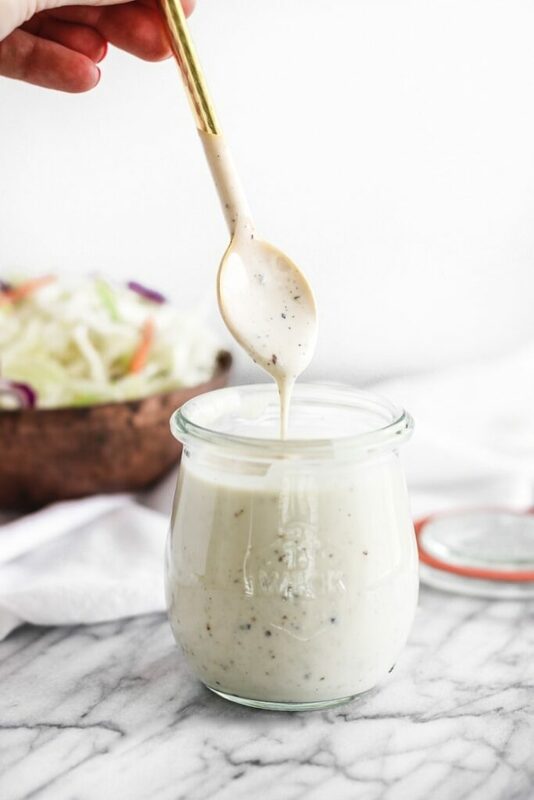 My version of creamy Greek yogurt coleslaw dressing is also a little healthier than most store bought versions since it doesn’t contain any added preservatives. It’s also made lighter with Greek yogurt and the sugar is cut way down with just a touch of honey. No sugar or sodium bombs here! 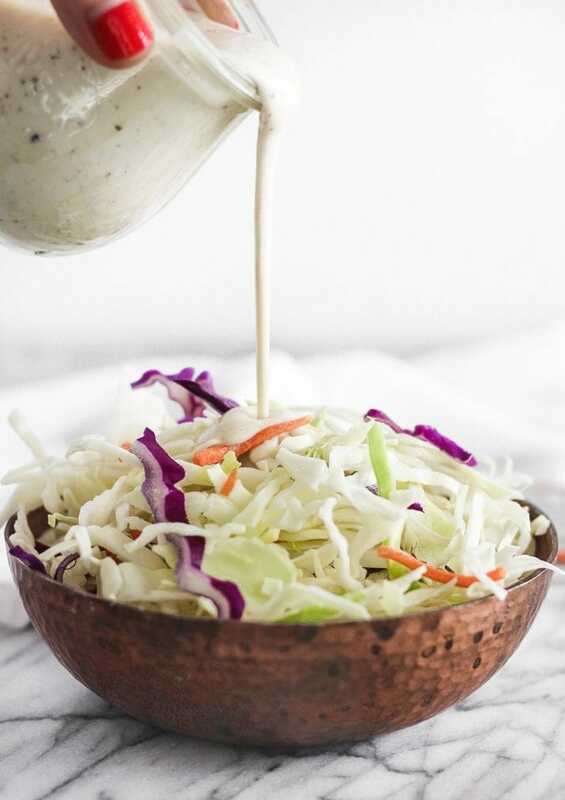 With this healthier version, coleslaw, broccoli slaw, and broccoli salad are healthy side dishes you can whip up any time! To make coleslaw, pour over about 5 cups coleslaw or broccoli slaw mix. Hi Trish! The dressing should last as long as the date on the yogurt, but I try to use it within about a week or so. I don’t include calorie counts on my recipes, but you can use one of the many free online calculators to estimate if you’d like.